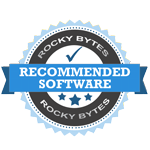 "A freeware ad-blocker that blocks just about every kind of ad on the Internet and significantly speeds up your web browsing." While there are tons of ad blockers out there available on the Internet, there are only a few truly good freeware ad blocking software you can find that works in the background on your system to block ads and pop ups on all of the browsers you use on your computer. 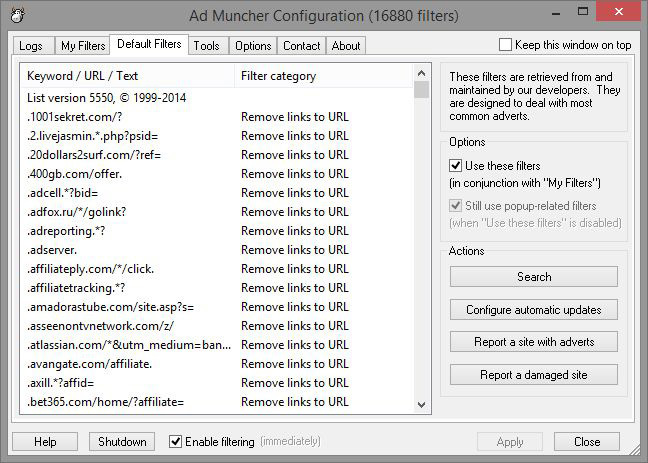 A developer that is dedicated to giving you a quality product for completely free, and directly competes with paid ad blockers - Ad Muncher stands out from the rest and does its job very well. Internet ads have always been a problem while surfing the Internet. They're intrusive and annoying. While they have a good purpose of supporting the websites they are on, sometimes these ads go way out of hand - especially video ads that play in the background. If you like listening to music while surfing the Internet - everyone has had an experience of an ad ruining the song they are listening to and sometimes scaring you. All of this can be eliminated on every Internet browser you use for completely free - no additional plugins required. Internet ads and pop ups are not only intrusive and annoying, they also significantly slow down how fast webpages load which can completely ruin the content you are attempting to access. These ads can even slow down your computer while they are loading, which is also very annoying. Why deal with all of this when you don't have to? You don't have to, and that's why there's quality applications out there like Ad Muncher to prevent this from happening to you. 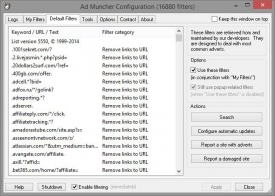 Use the Internet and surf your favorite websites without having to deal with all of the ads to annoy and slow down your surfing experience during your leisure time by downloading AdMuncher for free right now.